Authentic and family-friendly Italian restaurant in Tierrasanta. 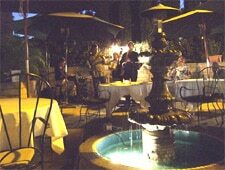 : It’s difficult to find good food in certain corners of San Diego County, but thankfully Tierrasanta has Andiamo! The first hint that we will like Javier Ugarte’s family-style restaurant comes when fresh-baked rosemary focaccia and an accompanying chunky tomato-basil dip hits the table. Artichoke hearts stuffed with goat cheese and walnuts in a brown butter sage sauce make for a nice starter. Spicy meatballs in red pepper sauce are another compelling bite. For a salad, consider diver scallops tucked into chopped baby frisée with nuggets of pineapple and walnut in a white truffle oil drizzle. Specialties include the garlicky portobello scampi, and the prosciutto and fig flatbread. Duck breast rests on a bed of wild mushroom ravioli and is adorned with a port-cranberry reduction. Ugarte's tender veal scallopine in a lemon-caper sauce is another winner. And like all good Italian spots, Andiamo! serves a mean tiramisu, though its budino is a longstanding family tradition --- warm bread pudding with sweet Tuscan bread and chunks of dark chocolate.